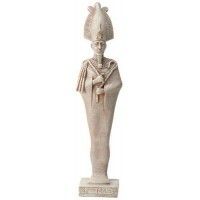 Osiris, the Resurrection God, is the central figure in the afterlife myth and in Egyptian mythology as a whole here in a lovely bronze resin statue. His name means "The Seat of the Eye". To die and be properly prepared for the other life is to become one with Osiris in the underworld over which he rules. Osiris received earthly rule from his father, Geb. His brother Seth envied his rule; he enticed Osiris into a chest and flung him into the Nile. His wife, Isis, sought and found his body and with her own magic powers and the help of Thoth, Nephthys, Anubis and Horus, restored Osiris to life. Osiris, however already belonged to the world of the dead, and although after his resurrection he could have reclaimed his throne, he preferred to maintain his kingdom in the Land of the Dead, leaving his vindication on earth in the hands of his posthumously born son, Horus. Some consider him the origin of the Resurrection myth, celebrated by Christians as Jesus Christ. Some Egyptologists believe a human Osiris was one of the earliest, pre-dynastic rulers of Egypt later made devine. This stunning statue of Osiris is cast bronze resin with hand painted color detail, including green on face and hands denoting his role as a God of rebirth. Statue is 10 2/3 inches tall. Item Number: UI-WU77216A4 | Approximate Size (Inches): 4.00 wide x 3.00 deep x 10.55 high | Approximate Shipping Weight: 3.00 lbs.